At 10 years and three months old, Hana Goda has started grabbing headlines in table tennis when she dazzled at the 2018 Swedish Junior and Cadet Open to finish as runners’ up in the girls’ U-12. At the ongoing Tunisia Junior and Cadet Open, the little Hana Goda is full of life jumping from one place to the other with a lot of excitement to compete against the best. Accompanied most times to competitions by her mother – Radwa Azab, the charming Egyptian shinning is hopeful that she can exceed the imprint of her role model – Dina Meshref. Narrating how the romance with table tennis started for Hana Goda, Radwa Azab said: “When she was four years old, we were looking for sports she could take to and we decided to try swimming, gymnastics and handball but we found out that she did not like any of them. But when we took her to Ahly Club in Cairo, she started playing table tennis on March 1, 2012 and the club noticed that she was very intelligent on table so they made a special table for her to train because of her height. Since taking to table tennis, we noticed that she has become more sociable and very active even in her academics,” the mother said. 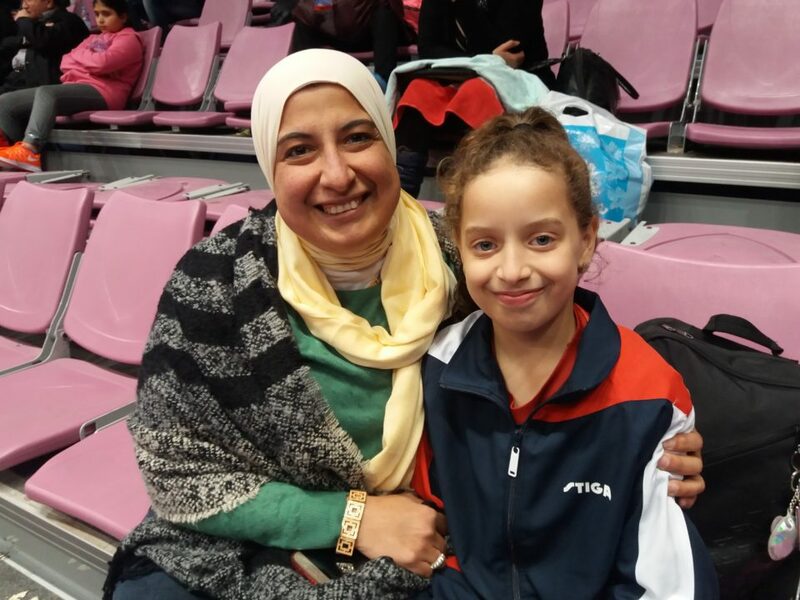 At present, Hana Goda is Egyptian national U-12 champion and among the top four in U-15. The journey to start playing internationally started for Hana Goda in 2015 when she featured in the Swedish Junior and Cadet Open and she has been a regular at the tournament in the last three years while her breakthrough in the tournament came this year when she finished second in the U-12 (min-cadet) event. In 2018, Hana Goda has featured in three tournaments in Oman, Sweden and now Tunisia but all these trips were funded with support from her father – Professor Ayman Goda, who is an employee at Ain Shams University, Faculty of Medicine in Egypt, which is one of the largest educational medical institutions in Africa and the Middle East. But the mother who is attached to her daughter said the passion for table tennis for her daughter is a natural gift. “I cannot fathom how the gift of the sport came to my daughter but what I know is that it is from God. Apart from her excellent performance in table tennis, she is very dedicated in her studies that most times when she misses school assignment, she makes up for it after returning from her trip. I cannot leave her alone to go all about and fund has been a major issue for us to get her a coach and that is why most times she plays without any coach. Even when she played in Swedish she played on her own. I only give her tips whenever she is about to play but I have never sit behind her. Playing alone has really helped her confidence and for us this has made her to be independent in whatever she wants to do,” Radwa Azab said. Hana Goda, at present a member of the Egyptian junior national team and the a national U-12 champion.